Apps are filling gaps for those who want to improve, mentally or physically. 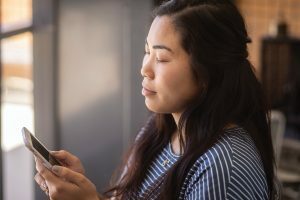 Users who want help beyond traditional mental-health therapy can launch smartphone apps to practice such things as breathing techniques and guided meditation. Photo by Bradley Slade. For more than seven years now, recent psychology grad Taylor E. Mefford (BS ’18) has been dealing with anxiety, especially when he thinks about the future and looming deadlines. For him, anxiety causes tightness in his chest and trouble concentrating. “When I’m feeling anxious, I get so worked up about the task at hand that I can’t even focus on it,” says Mefford. “To make matters worse, I’m physically uncomfortable because I can hardly breathe.” He’s experienced his share of counseling but now relies more heavily on smartphone apps to manage his symptoms. “It’s much cheaper than therapy and also allows for greater flexibility in treatment. Some people don’t want to have a therapist holding them accountable, and the autonomy can be really freeing,” says Mefford, who will begin a master’s in counseling at Fordham University this fall. He finds that Headspace—an app that teaches meditation and mindfulness—helps him address his anxiety. “Mindfulness is about taking your attention away from the future to focus on the present instead. Headspace provides a guided method for what to focus on and how to focus on it in a way that keeps future events where they belong—in the future,” says Mefford. According to a trio of BYU health-sciences professors, Mefford is not alone in finding meaningful support from apps for emotional, physical, and nutritional health. “Mobile technologies are everywhere, and millions of people are using them with the hope they can improve their lives—but do they actually change behavior? The answer is generally yes,” says professor Joshua H. West, who studies the apps with Benjamin T. Crookston (BS ’03, MPH ’06) and P. Cougar Hall (BS ’98). Although mobile technologies are often associated with harming health, the professors believe self-help apps are technological blessings and have the potential to help just about anyone move to a higher level of mental and physical health. Anxiety is one of the most common mental-health disorders in the United States today, with 18 percent of adults affected, according to the National Institute of Mental Health. Another 6.7 percent of adults experience major depression, and millions more suffer from challenges ranging from phobias to attention-deficit disorder. Many adults don’t seek professional help for mental-health conditions, or they delay getting help until they’ve suffered for a long time. Self-help books, seminars, and online courses have been filling these gaps, and now smartphone apps are joining the mix. Mefford considers his anxiety well managed now. He’s used about a dozen apps over the years and thinks many more people ought to try them. “They have a lot of potential, especially for people who are new to dealing with depression and anxiety or just are dealing with a dark episode in their lives,” he says. He plans to use apps in his future counseling practice to augment therapy and to give clients support between sessions. For many decades now, the triple threats of heart disease, stroke, and type 2 diabetes have been the leading cause of death among Americans. All are related to obesity, which often can be overcome with a healthy diet and physical activity. But only one-fifth of Americans get the recommended amount of exercise, which is about five hours per week of moderate-intensity activity (the minimum recommended is 2.5 hours). In a second study, he and his colleagues analyzed 207 responses to a survey about physical-activity apps (respondents were half women and half men). About 40 percent of those surveyed used either a Fitbit or MyFitnessPal and reported high satisfaction and success in reaching health goals. For example, if a woman walks six long blocks and her Fitbit tells her she’s burned 50 calories and accomplished 30 percent of her daily goal, she’ll likely be motivated to walk farther to burn more calories. West says frequent app usage helped users meet their goals, with about 89 percent using the apps either daily or several times a week. Fails used MyFitnessPal to track his food intake and found it life changing. “It’s as easy as scanning a bar code with your smartphone or typing in a food. Over time, I found myself interested in more than just calorie counting—I wanted to know more about the quality of the food I was eating,” he says. West believes app developers could improve diet and nutrition apps by incorporating more real-life, proven practices from the non-digital world: “It’s doable but will require them to more intentionally integrate what researchers know about how people change their behavior. Somewhere along the way, developers became more interested in the user interface and have neglected behavior research,” he says. The BYU health experts say apps can increase users’ “self-efficacy,” or their ability to cope with challenges in a sustained way, adding power to any efforts to achieve emotional and physical health goals. • BreathetoRelax (free) teaches breathing techniques to manage stress. • MoodTools (free) helps users to track their thoughts so they can identify distorted thinking and improve their mood. • HeadSpace (variously priced subscription levels) focuses on guided meditation. It offers both short and long sessions for beginners and experts. • Happify (free) helps diminish negative thoughts and increase resilience. • PocketRehab (free) instantly connects users with one another for sobriety support and encouragement. • My3 (free) provides education and encouragement to those with recurring thoughts of suicide. Users choose three people to help them stay connected, making them less likely to act on destructive thoughts. • Idealweight (free) provides users with a personalized ideal weight range. • MyFitnessPal (free for basic use) helps users count calories with its exhaustive list of grocery items. • Pacer Pedometer and Step Tracker (free for basic use), tracks your steps (smartphone must be in your pocket or purse) and provides workout videos.